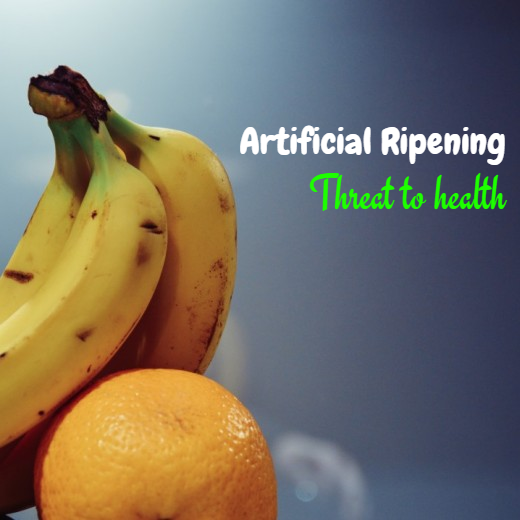 Artificial ripening is a threat to health? Ripening is a process that renders fruits to become edible, sweeter and softer. During ripening, fruit goes through various chemical changes, like the conversion of complex starch and acid to simple sugars, increase in fiber content and the replacement of green chlorophyll with yellow or orange or red pigment. In this article, we will understand what is artificial ripening, the various ripening agents and whether artificial ripening is a threat to health. The demand for artificial fruit ripening arose to provide fruits to the customers during offseason. Also, unripe fruits are ripened during the due season to meet the high demand and make high profit off seasonal fruits. Besides, ample quantity of fruits is also exported to different parts of the world; this may take several days from plucking the fruits from the tree until them reaches customers’ table. During this time, the naturally ripened fruits can become overripe and inedible. To minimize the loss, fruit-sellers prefer collecting unripe fruits and artificially ripen them to prolong their shelf life. An organic compound concerned with ripening is ethylene, a gas created by plants from the amino acid methionine. Ethylene is the chief ripening agent produced naturally within the fruits which initiates the process of ripening. There are numerous ripening agents to release ethylene in order to speed up the ripening process. Chemicals like ethanol, methanol, ethylene glycol, Ethephon, calcium carbide are used to ripen fruits and vegetables artificially. The use of calcium carbide is much common for its inexpensiveness despite its ban due to its harmful effects. Ethylene: A very minute strength of ethylene is adequate to stimulate the fruit ripening process It has been used to ripen apple, avocado, banana, mango, papaya, pineapple, and guava. Calcium Carbide: Calcium Carbide is widely used in different parts of the world and popularly known as masala though banned under PFA rules. Once applied on the fruits Calcium Carbide comes into the contact of the moisture and releases acetylene, which has fruit ripening characteristics similar to ethylene. Industrial grade calcium carbide has traces of arsenic and phosphorus hydride, which are dangerous for human health. The early symptoms of arsenic poisoning include vomiting, diarrhea, sore throat, cough and shortness of breath. Examples of fruits ripened with Calcium Carbide are mango, banana, papaya, sapota, dates, and tomatoes. Ethephon: Ethephon is used to artificially ripen pineapple, banana, and tomato. Ethephon 39% is accessible in the market in the commercial name of ethrel. Ethephon is often considered better than calcium carbide. Health hazards include excessive salivation, sweating, tearing headache, dizziness, nausea, vomiting, abdominal cramps, diarrhea pin-point pupils, sometimes with blurred or dark vision. The external color and the texture are usually taken under consideration when it comes to selecting right fruits. The naturally ripened fruits are often uneven in color. It is advisable to choose fruits during the season when it turns ripe naturally since a ripe fruit during offseason may artificially ripen unless it genetically ripens. Before eating, rinse fruits thoroughly under running water to wash away the chemicals. It's better to peel off the skin since it contains the chemicals. Preferably include seasonal fruits that are sold in local markets instead of purchasing in supermarkets.